2007 World Open: Exterminator is Back! A determined William Morrison takes a swig during battle. The "Exterminator" scored 7-2 to tie for 1st in the under-2400 section. The blitz legend has returned in full form. Photo by Daaim Shabazz. Many people have been wondering what has happened to William "The Exterminator" Morrison. In an interview with The Chess Drum, he actually said (ala Arnold Schwarzaneggar), "I'm back." The New York/Maryland legend has made an auspicious return to tournament play and routed his opposition with an undefeated 7-2 at the 2007 World Open. "I prepared for this tournament," he asserted. He also mentioned that he went into the tournament with the right frame of mind. Watching Morrison throughout the tournament, one can see that he had fire in his eyes. "I was very confident. At one point I had a rating of over 2500, so I had a lot of confidence to do well in the under-2400 section," he added. In this tournament he had a couple of games that he noted… wins against Slavisa Peric and Dmitri Shevelev. Morrison also had an exciting game against Nigerian Champion Chikwere Onyekwere. He told The Chess Drum of the young champion, "He tried to come after me." Onyekwere had a solid tournament with 6-3. 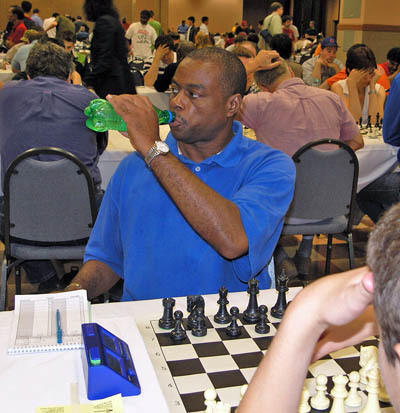 Morrison also stopped a torrid Vishnuvardh Arjun (who earned his first IM norm) before ending by drawing Ilye Figler. There was actually a 5-way tie for first resulting in a lucrative prize. Morrison stated in the interview that he plans to pursue his last IM norm, but that earning norms in the U.S. is exceedingly difficult. He suggests that a grassroots effort to popularize chess from the ground up will be the way to attract sponsors and thus, provide more opportunities for big tournaments. Listen to interview with William Morrison!